Based on the principles of Podiatric medicine, Superfeet’s shape, design and manufacture have set the standard for support and earned over 40 U.S. and International patents along the way. 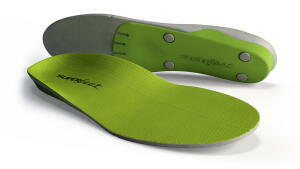 Superfeet insoles help adapt the flat, 2-dimensional mid-soles of your footwear to your 3-dimensional foot. The distinct Superfeet shape helps to stabilize the foot, while the deep structured heel cup and full-length foam provide support and comfort. Superfeet focuses on supporting the rear foot because that is where the majority of foot motion (standing, walking, and running) originates. Most superfeet have an organic odor-control coating that helps eliminate bacteria growth. Green Superfeet have the most shape and support of all the colors and can provide relief from such things as achilles tendonitis, plantar faciitis, shin splints, and just achy arches (to name a few).